The bower of prayer. Maria Falconetti gives an impassioned performance as the 15th century teenage heroine of France, Jeanne d’Arc, in Carl Th. 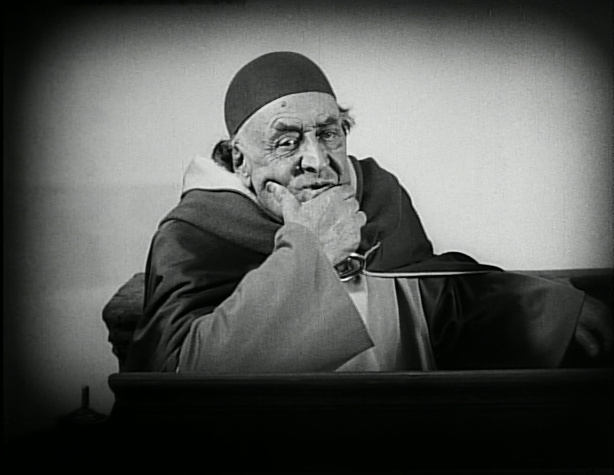 Dreyer’s silent masterpiece. J. – This film really blew me away. I know it is ranked in Sight & Sound‘s Top 10, and consequently I should have expected a remarkable movie, but I was not prepared for how much I not only enjoyed this movie but how powerfully affecting it was. (Strangely enough, The Passion of Joan of Arc made the Top 10 in the first Sight & Sound poll in 1952, was demoted in 1962, returned to the Top 10 in 1972, demoted in 1982, returned in 1992, demoted in 2002, and returned again in 2012 — we’ll have to see about 2022.) As readers can see, the movie has leapt to the #1 spot of my Top 10 list, and though we are in the very early days of our experiment, I can easily see it retaining a top spot for the duration. I’ve never seen a film quite like this, and I was mesmerized all the way through. But none of that is really saying anything about the movie — sorry about that. I suppose the place to start is Dreyer’s unusual choice, mentioned in the summary above, to shoot the vast majority of the film in close-up. I found this to be tremendously effective, and I find it rather hard to believe that nobody had come up with the idea earlier. It is easy to mock the histrionics and broad, sweeping movements made by so many silent film actors, but without sound, performances are by necessity about clearly projecting emotion and intent. (That said, Gustav von Wangenheim’s performance in Nosferatu cannot be pardoned.) But is there any better instrument for conveying such information than the human face? By keeping in tight to the actors’ performances, those stereotypical gesticulations have no place (or at least can’t be seen) and subtle eye movements become enough to convey rafts of meaning. In addition, the proximity creates an emotional connection to the characters, but the viewer is also frequently brought in uncomfortably close, which is disorienting and unsettling. Every little thing in this film hit so hard on an emotional level without feeling grossly artificial. S. – This was an incredibly powerful film. The continual close-ups generated a compelling intensity and invited you to see every nuance of emotion that passed over the actors faces. Hence much was communicated in few words. In fact the intertitles were sparse, when arguments were taking place it was enough to see the rapid fire speech and fierce expressions. I liked that because it shows trust that the audience is following you without (quite literally) spelling everything out, to me that is a director who understands movies. It was a very intelligent move by Dreyer. Another benefit is when an intertitle does appear you know it really has something to say. I was hugely impressed by the detail picked up on film, apparently the actors were not permitted to wear make-up and all the detail in their complexions is captured. This was a particularly effective way of illustrating the age difference between Joan and her accusers, reinforcing the power differential evident through her trial. By having actors forego makeup and filming them in bright light with white walls, Dreyer made every little pore and crevice in his actors’ faces come to the fore. Without the benefit of sound, this arrangement enabled the actors to be supremely emotive and communicative with the smallest gestures. J. – The collection of faces was a marvelous menagerie. The use of intense closeups, the lack of makeup, and the stark lighting really let you see each and every imperfection in all of the actors’ faces, which was a bold choice not just for the director but also the actors involved. This prominent display of the effects of age served to simultaneously humanize and demonize Joan’s accusers, making them seem alternately grotesque or defeated as the occasion called for. I said above that the performances delivered authentic emotional punch without the theatrical artificiality of so many silent performances, but I think it is fair to say this is an intensely artificial movie. The camera is often positioned at exaggerated angles, faces are frequently cropped so tightly as to vigorously violate a character’s personal space, edits between shots rarely had any coherence (that is, the camera may go between Joan and a questioner without bothering to care whether it looks like they are actually facing each other), and the sets are gloriously Spartan (not what one expects from a 15th century castle). But it doesn’t matter in the least, because all of these elements mean that the viewer has little choice but to hone straight in on the performer’s face and the emotion of the moment. And because these shots are framed so tightly on each face, every movement ripples into great emotional payoffs — intertitles are almost unnecessary when the camera pretty much bores into each character’s soul. And I agree, S., that the general lack of intertitles really served the movie well and kept the pace from flagging. S. – The emotional range of the lead actress, Maria Falconetti, was particularly striking. At the beginning of the movie it is claimed that the dialogue comes directly from transcripts of Joan’s actual trial, Falconetti’s interpretation brings such potentially dry material to life. She was utterly convincing as a confused and harassed girl out of her depth, the transformation of her features when questioned about her calling from god was magnificent. A few members of the prosecution are swayed to believe her a saint after seeing her testify and the power of this performance makes this seem plausible. To the less romantic/foolish among the priests it becomes clear that bullying won’t secure her confession, Joan’s conviction is unwavering and possibly maniacal. The possibility that they are hounding a mentally unstable girl to her death emerges and with it frustration and faltering resolve come into the mix. The display of so many different interpretations and reactions to the unfolding trial without the aid of lengthy spoken exchanges is a testament to the skill of the director and his cast. Maria Falconetti’s emotional set goes through an intense rollercoaster across The Passion of Joan of Arc, and she sells it with an unflinching intensity. J. – Years ago I read a quick synopsis of this movie on the website for the Criterion Collection (which is the version we watched), and it was pretty much all I knew about the film. That blurb claims Falconetti’s performance as being one of the greatest ever filmed. That’s a heady claim to make, and now that I have seen the film I can’t help but feel it to be wholly justified. She is a revelation throughout the film, and I say revelation particularly because of that calling from god you mentioned. Falconetti’s Joan is often so vulnerable and looks so frightened and confused, if not downright in pain. But she has these moments where she gains power and conviction, where she clearly receives her own personal vision of divine favor and protection, and the transition Falconetti makes when these bursts of inspiration flood over her is amazing. Her eyes widen and seem to radiate light as she becomes a strange combination of confident, crazed, defiant, and numinous. It really does straddle this fine line between the appearance of divine grace and undiagnosed schizophrenia. And I think it is very much to the film’s credit that it never really comes down on one side or the other, but rather lets the performance drive the viewer’s interpretation. The screen captures below are from a sequence in the torture room. While being questioned, Falconetti has entered into one of her crazed states of defiance, thereby prompting the vitriol shown by the cleric in the next shot. It is a testament to the power of the movie and Falconetti’s performance that the priests can seem so very in control of the trial and the prisoner, who is often weeping and cowed (see photo above), but that she can suddenly burn from within and utterly change the emotional tenor of the scene, driving her persecutors mad with frustration and surprise. 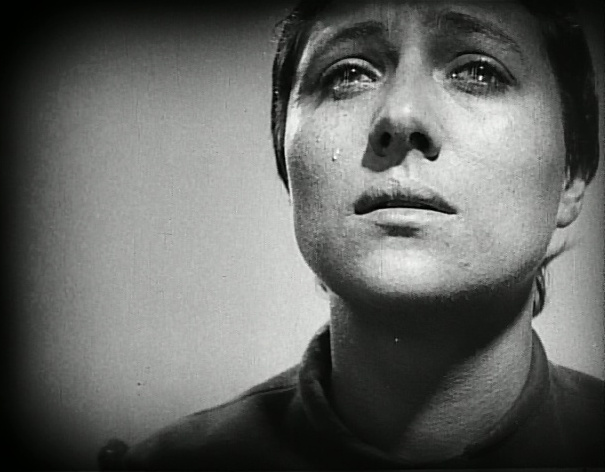 And Dreyer’s photography pulls every iota of fury, impatience, and disdain from the clerics and soldiers. These whiplash jerks from emotional extreme to emotional extreme give the film its raw power, but it really is fatiguing for the viewer (in a good way). I felt drained after the film, which is to say I was strongly invested in Joan’s emotional turmoil throughout. S. – The drama does keep you in thrall, it was impossible not to feel invested in the outcome. And it was with growing dread that you come to realise the inevitable tragedy that will follow. While the subject matter offered many opportunities for gruesome acts of cruelty I was relieved that this wasn’t considered necessary for this film. Brutality was conveyed very effectively without being graphic, although the final scenes of the heroine’s demise I found especially harrowing. Throughout this movie does a lot with a little and does it very well. The majority of film time is spent tightly cropped in on the protagonists’ faces, however, there are some very interesting scenes cut into the story as the trial builds towards its final act. We see a few exterior shots, taken at unnatural angles, that give a sense that the locals’ expectations are building, that unrest may be just around the corner. A shot taken from a high camera looking directly down onto the intricately cobbled streets below I found particularly arresting after the blank interiors where Joan was held. Even at a glance one can see the sharp difference between the exterior scenes at the end of the film and the stark interiors that dominate the first part of the film. The inclusion of so many more people in the frame, the unflinching violence, and rapid editing add another layer of intensity to the emotional wallop the film has already provided the audience. J. – And that unrest does explode in violent fashion as Joan is executed. The riot sequence that ends the film is frenetic and brutal, or at least it comes across that way after the stark simplicity of the trial scenes. And even in death Joan holds an emotional grip over the film, with Dreyer willing to actually show her body burning on the stake, which is the stuff of nightmares. The cutting back and forth between the execution fire and the smoke-filled scenes of panic almost literally spread Joan through the riot, her wind-blown ashes fueling and coloring the violence. The riot doesn’t really act as a catharsis, however. No real relief is offered the audience to escape the emotional wallop of Joan’s ordeal, which you rightly refer to as harrowing. But I’m glad that’s the case, the palate should not be cleansed of so wonderful a performance, draining as it may be. And because this was Maria Falconetti’s only performance in a feature film, it will always remain pristine and unique. Maria Falconetti give what could very well be the finest performance ever committed to film. Hard to disagree with you there, Emma. Even if you wanna argue that it isn’t the finest, her performance is wholly, 100% unique, which is amazing to say about anything more than 85 years old. — J.